On Friday, September 5th, we continue our series of FREE workshops at our NYC campus with a presentation on running an independent label with music industry veteran MING. 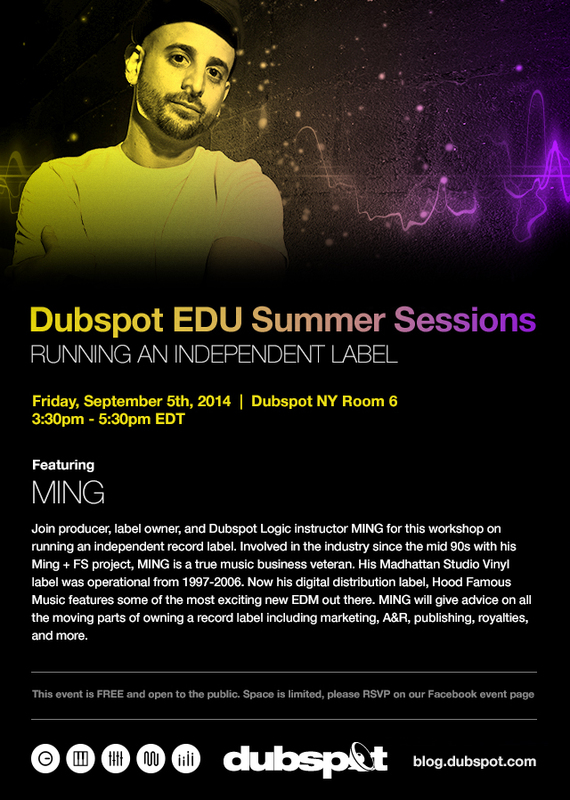 Join producer, label owner, and Dubspot Logic instructor MING for this workshop on running an independent label. Involved in the industry since the mid 90s with his Ming + FS project, MING is a true music business veteran. His Madhattan Studio Vinyl independent label was operational from 1997-2006. Now his digital distribution label, Hood Famous Music features some of the most exciting new EDM out there. MING will give advice on the all the moving parts of owning a record label including marketing, A&R, publishing, royalties, and more. MING has an upcoming project entitled Abstract the Ism. We asked MING a few questions about the release and his workflow. Abstract the Ism is a nod back to my Ming+FS days. It’s mostly experimental hip-hop with elements of other bass genres. You’ve been making EDM for some time now. What made you want to go back to your hip hop roots? Most of my productions stem from my hip-hop and rock roots so even when I’m producing a house track, I’m using techniques that I learned from producing hip-hop. I had been collecting some hip-hop beats and really didn’t know what I was going to with them until Elementary (aka Jumpshot) heard them and was basically like, “Let me work on that!” We both just decided it would be dope to do a dusted breaks kind of record. Can you tell us a bit about your collaboration and work with the EDM Network? The EDM Network (EDM.com) is an amazing group of music curators and music lovers. The network itself has channels for almost every important genre and sub genre not only on it’s own sites, but on Soundcloud as well. The guys at the network really care about the music that they highlight and it shows in the strength and size of their fan base. I highly recommend that up and coming producers submit their music to EDM’s channels, as it’s a great place to share your music with new fans. Scratching is featured heavily on a lot of these tracks, is that a skill you keep up with and consistently practice? Honestly, I’m not in practice. I should practice on a much more regular basis but its hard to find the time. For this album, I had to break the scratching down into phrases and edit them together. In the past I would just learn the full phrase and practice it until I could record it in one pass. But now that I’m working on so many records simultaneously its hard for me to put in enough time into staying sharp with my scratching skills. How is your approach different in making a hip hop track vs EDM? I approach all of my productions in the same way. I try to make the drums knock and keep massaging the track until it’s got the right vibe. If the track has vocals, then I make sure that the vocal is the main focus and the rest of the production supports the song. How has your production process evolved from the MING + FS days to today? None of the Ming+FS records were made on a DAW. We used digital tape machines like the Tascam DA88. This meant that the productions had to be made in more of a linear fashion. Each element was added to the multi-track recordings and if a section happened a second time, we had to record that section again. Today’s DAW and plugin technologies make the recording process so much faster and a lot more flexible. The ability to switch from one project to another without having to recall mixer or EQ settings has allowed me to get an incredible amount of music written, produced, and recorded all without having to spend as much time on the technical side of the process. I currently work in Logic X with a good handful of plugins. Can you tell us a bit about the rappers you collaborated with on this? Nafis and Werdplay (aka Eleanor Rugby) are both MCs that were heavily featured on the Ming+FS productions. We’ve stayed in touch over the years and when I reached out about collaborating again, they were both in 100%. Werdplay brought Tough Junkie into the project. I’m finishing up an indie rock/electronic album under the name Kelly Green that I co-wrote and produced with Toby Martin from Youth Group. I describe the music as The Postal Service meets The Pixies. On the dance side, I have a single with Shwann featuring Niclas Lundin coming out on Big Alliance Records for their Amsterdam Dance Event compellation. Also, look out for my next single that I produced with the Disco Killers called “Its My Birfday” featuring Fatman Scoop and Princess Superstar. I’ve also been slowly working on my solo album, which I hope to finish by October or November. I wanted to do something vocal based so I’ve been collaborating with a number of super talented artists. It’s multi genre like most of my records but probably won’t be as hard as my Firepower Records Blackout EP. Think something along the lines of a Sub Focus, Nero or Sevens Lions release.